Sun's spectrum - Universe Galaxies And Stars Section. M39 - Credit: Heidi Schweiker/NOAO/AURA/NSF. I hope everyone had an excellent Perseid weekend? With the Moon further and further from early evening, studies begin again with planetary nebula, bright star clusters, globular challenges and distant galaxies. The coming weekend offers up the Delta Cygnid meteor stream and well as some great binocular studies! Get ready to rock. Monday, August 14 - Are you ready for a real challenge? Then look no further than planetary nebula NGC 6790 in Aquila. Hope for a really still sky, because this tiny planetary will need it to catch your observing eye. Try using a nebula filter in a mid-power eyepiece for a “before and after” approach to distinguish this 10th magnitude planetary from neighboring 10th magnitude stars. To find it, center on Delta Aquilae, and drop almost two degrees south, then a bit west. If you're on the planetary it will be near the middle of the 100X field. Install the filter and note which star doesn't lose its luster. No filter? Then try again on a fine night of excellent sky stability and inspect every star closely at twice the magnification. Once you find this tiny sky gem, don't forget to congratulate the navigation and subtle study skills you have acquired in your observing! Tuesday, August 15 - With early dark skies, let's take a look at a bright star cluster equally fine in binoculars and telescope - M39. Located about a fist-width northeast of Deneb, you will easily catch a couple dozen members in a triangular pattern through binoculars. M39 is particularly beautiful because its brightest components seem almost three dimensional against a backdrop of fainter members. Younger than the Coma Berenices cluster, and older than the Pleiades, this loose, bright galactic cluster is some 800 light-years away. Its members are all main sequence star stars, the brightest of which are beginning to mature into red giants. For more of a challenge, look no further than Sadr - the 2.3 magnitude crux star in the middle of the Northern Cross. Once centered at low power, shift Sadr half a degree north to get a view of the two dozen fainter stars of smallish NGC 6910. Notice the Y-shaped pattern of its brighter members! Wednesday, August 16 - Tonight we have over an hour of dark before moonrise, so let's head south to study a pair of fainter globular clusters in Sagittarius. At low power, locate Delta - the northeastern star of the “spout.” Going southeast a little less than a degree will reveal 8.3 magnitude, highly condensed NGC 6624. To locate our next study, use Delta and Gamma (Al Nasl) to form the base of an equilateral triangle with the point to the south. At low power you will see slightly fainter NGC 6569. To complete our tour of the region, be sure to revisit NGC 6522 and NGC 6528 within a degree northwest of Al Nasl. All these globular clusters were discovered by William Herschel in June 1784. Of the four, NGC 6522 and NGC 6528 are within 2000 light-years of our galactic core. Thursday, August 17 - Tonight at skydark, look for the constellation of Telescopium. Its three main stars were named by Abb? Nicolas Louis de Lacaille during a trip to the Cape of Good Hope during the years 1750-1754. Let's have a look at the brightest star of a constellation that commemorates all telescopes. To find Alpha Telescopium, start at Epsilon Sagittarii and look about a fist-width south. Once you've found Alpha, look a little less than a degree east in binoculars for visual double Delta 1 and 2. Now hop 4 degrees northeast to revisit globular cluster NGC 6541. This splendid southern sky study will appear as a large faint globular with a bright star to the northeast. Friday, August 18 - On this day in 1868, Norman Lockyer became the first astro-chemist to see helium absorption lines in the Sun's spectrum. The element helium is the second most abundant in space and we can see a helium rich star tonight by revisiting Alpha Telescopii - an example of a helium diffusion star. Located some 250 light-years from Earth, it shines with the luminosity of nearly 900 suns - but unlike our Sun, a significant proportion of its light is emitted by excited helium in the star's 18,400 degree Kelvin photosphere! Now let's look west-northwest from Alpha Telescopii a little more than 5 degrees to locate the very faint glow of 9.2 magnitude globular cluster NGC 6496. Look for 5th magnitude star SAO 228562 that accompanies it. Saturday, August 19 - Born today in 1646 was the self-educated English Astronomer John Flamsteed. Despite a rather difficult childhood, Flamsteed's passion for observing led him to become First Observer at the Royal Observatory where his catalog of 3000 stars became the most accurate of the time. Flamsteed numbered stars in accordance with their right ascension location in the sky - rather than by relative brightness (Bayer's method). Flamsteed numbers are still in use today and capture stars down to the 6th magnitude. If you're up early this morning, you can see the lunar crater named for Flamsteed as a large, faint ring east of crater Grimaldi in the Oceanus Procellarum. Also born on this day, but in 1891, was Milton Humason. A colleague of Edwin Hubble at Mts. Wilson and Palomar, Humason was instrumental in measuring the faint spectra of galaxies, which in turn provided evidence for the expansion of the universe. Tonight let's honor Flamsteed and Humason while challenging ourselves by having a look at an 11.1 magnitude Galaxy - NGC 6951. This superb face-on barred spiral will show nothing more than a bright fuzzy core in small scopes. Mid-sized instruments will reveal two faint bars extending east-west, and larger scopes should look for faint spiral extensions winding outward from the two bars. To find NGC 6951, locate 4 Cephei, then head south-southwest less than a degree. Sunday, August 20 - Have you caught Mercury yet? Then try looking at Saturn this morning with binoculars. They'll be wonderfully close! Tonight is the peak of the Kappa Cygnid meteor shower. With the Moon comfortably out of the way for most of the evening, keep an eye on the radiant near Deneb. The average fall rate is about 12 per hour and includes some fireballs. Be sure to continue the watch over the next several nights as this shower continues for next two weeks! Normally, we'd go Galaxy hunting on a dark night such as this, but how about if we explore the wonderful world of low power? Start by locating magnificent M13 and move 3 degrees northwest. What you will find is a splendid loose open cluster of stars known as Dolidze/Dzimselejsvili (DoDz) 5 - and it looks much like a miniature of the constellation Hercules. Just slightly more than 4 degrees to its east and just about a degree south of Eta Herculis is DoDz 6, which contains a perfect diamond pattern and an asterism of brighter stars resembling the constellation of Sagitta. Now we're going to move across the constellation of Hercules towards Lyra. East of the “keystone” is a tight configuration of three stars - Omicron, Nu, and Xi. About the same distance separating these stars northeast you will find DoDz 9. At low power, you'll see a pretty open cluster of around two dozen mixed magnitude stars. Now look again at the “keystone” and identify Lambda and Delta to the south. About midway between them and slightly southeast you will discover the stellar field of DoDz 8. This last is easy - all you need to do is know the beautiful red/green double, Ras Algethi (Alpha). 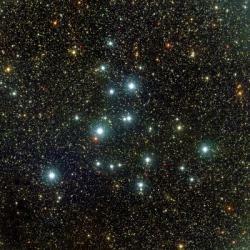 Move about 1 degree northwest to discover the star-studded open cluster DoDz 7. These great open clusters are very much off the beaten path and will add a new dimension to binocular and fast-telescope observing. Now let's try two more open star cluster studies found easily with large binoculars or a low power scope. The first is a rich beauty lying in the constellation Vulpecula, but is easier found by moving around 3 degrees southeast of Beta Cygni. Known as Stock 1, this stellar swarm contains around 50 or so members of varying magnitudes and could become a real favorite. The next is an asterism known as the “Coat Hanger,” (also known as Brocchi's Cluster, or Collinder 399). Let the colorful double star Albireo be your guide as you move about 4 degrees to its south-southwest. You will know this cluster when you see it, because it really does look like a coat hanger! May all your journeys be at light speed... Tammy Plotner with Jeff Barbour.